Imagine yourself as a “scientific car salesperson.” Your job is to study how to get people to buy your cars. People ask you questions about the cars, and you usually have an OK answer. But, imagine if you could actually visit the factory floor and see the cars being made in person. Might that be helpful in your car-selling studies? 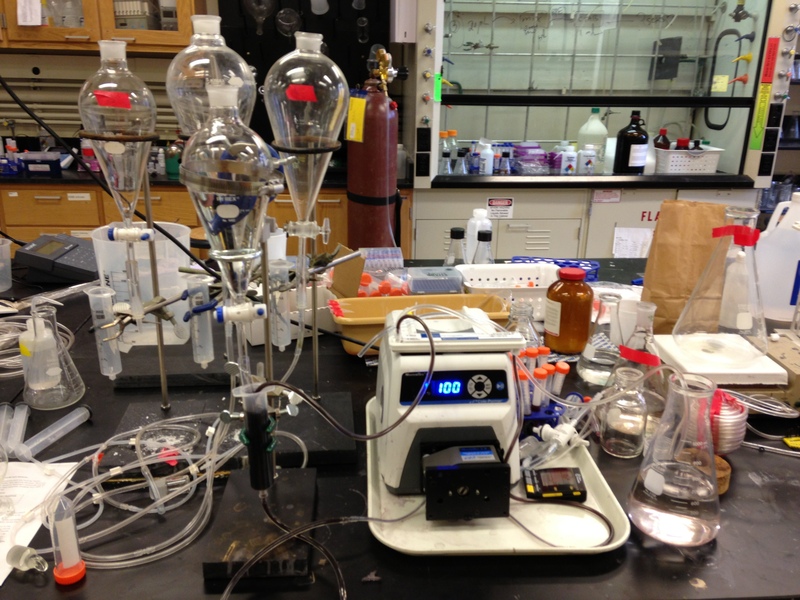 This is a crazy device Sam made that purifies nanoparticles. This thing is AMAZING! This IS the nanomaterial factory floor! I recently visited my collaborator, Sam, at the University of Illinois at Urbana-Champaign. Perhaps Sam will be upset with me for this, but he is the factory in this analogy. He is an expert at tailor-making gold nanoparticles. I’m not sure how I feel about this, but that makes me the car salesperson in this analogy. I do research at the University of Wisconsin – Milwaukee, where I regularly receive tubes full of Sam’s gold nanoparticles. I study the interactions of these nanoparticles with tiny water-borne creatures commonly called “water fleas,” or Daphnia magna, in order to understand their potential effect on the environment. Visiting Sam’s lab opened my eyes to an entirely new way of seeing my own experiments, and I can do better science now than I ever could have before. Now, doing your own science is hard enough—the hurdles you must overcome, the never-ending chore of reading literature. I have a tendency to get stuck in my own scientific bubble. A great way to burst that bubble and to better understand the science you are doing is by looking at your science from others perspectives. When I arrived at Sam’s lab, I did not know what to expect. I had never in my life made nanoparticles of any kind (except by accident in campfires). Sam quickly initiated me by showing me everything I need to know about how to make gold nanoparticles. It’s quite a beautiful process really. 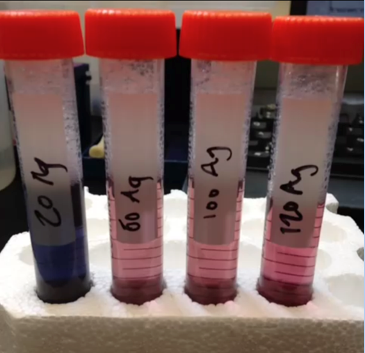 You mix colorless chemicals, and as the nanoparticles grow in size they eventually turn red. Red, not gold! After seeing how Sam creates the nanoparticles, wraps them in a coating, and purifies them (and how long that process takes), I have a whole new appreciation for those shipments of red tubes Sam regularly sends me whenever my “scientific sales floor” gets empty. Gold nanomaterials in water. I made these! Gold nanomaterials can be different colors depending on their size and shape. The nanomaterials in this image are actually nanorods, and from left to right they differ in “aspect ratio” (length/width) from 1.5 to 4.0. The labels show how much silver we used in their synthesis, which was what determined their shape. Sometimes the particles in Sam’s shipments clump together over time and fall to the bottom of their tubes or they interact with my water fleas in unexpected ways. Talking with Sam and seeing his work in action helped me understand how and why these things might be happening. I know my water fleas inside and out. However, my understanding of the nanoparticles was lacking. I could have spent time on the phone with Sam, or spent days reading papers to get this new higher level of understanding. However, the face-to-face discussion was much more valuable and interactive than any other paper or textbook I could have read. Just like the car salesperson, I have seen the factory floor. So, if a customer has a question for me, I am much more likely to know the answer (this is where my analogy gets a bit shaky, so I’ll abandon it). What I really took from the lab visit was just how valuable it is to collaborate with others and to take on new experiences whenever possible. The value of learning from others perspectives should never be underestimated. At its best, science is not an individual sport. Glad you are becoming even more multidisciplinary!